Oh I wish I could live at that house with the porch! I can just see myself sitting on one of those chairs taking in the view! And those colorful stairs! Wow! wow, what a nice little trip you have taken me on. the colors stairs are clever. 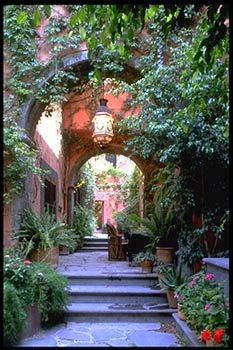 I think I've been to a couple of these places ~ that second photo looks like Casa Luna in San Miguel de Allende. These photos make me want to hop on the plane and head on down to Mexico. Mexico is one of my favourites places, I also like Ciudad de Mexico. 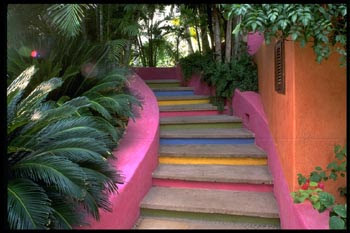 Love the painted steps! What fun colors. My goodness, beautiful color in those photos. That is such a wonderful quote! Beautiful images, you always find such amazing ones! **Zzzzzzz** Oh! Sorry. I fell asleep in the white lounge chair with the breeze caressing me, while watching the wave run from the island to the shore and back. Thank you for the sweet dream! 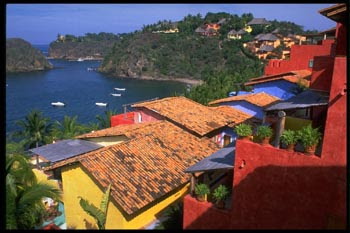 love the "caliente" colors of mexico...very nice! wish i were meandering down the path in the second pic right now! That indigo blue is just absolutely captivating! 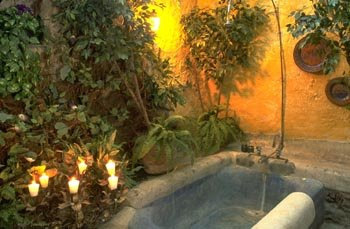 But most of all...that TUB! Someday I will create something like that in my garden. It is a MUST! Is the second photo of the shopping strip area of Puerto Vallarta? Gotta love the colors of utter freedom! Thanks for the beautiful pics Linda! When I was much younger (and white on white was all the rage in CA) I thought that the Mexican use of so much color was garish but now I love it and see the wisdom of it. Bring it on! What's your favorite color then, Linda? What makes you physically relax when you see it (color-wise, come on, now!)? 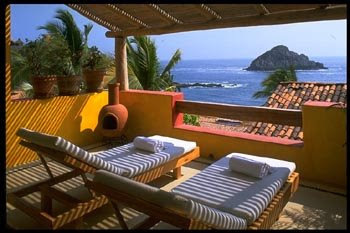 Love the image of the chaise loungers overlooking the ocean! Oh..how I would love to be there!!! Amy...My fave color is a mangoey persimmon. My foyer is that color...our guest house...and the inside of the pool area too (overkill). 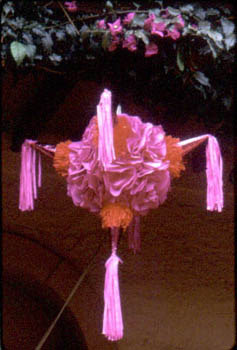 It soothes my soul, and I see it all over Mexico and South America. 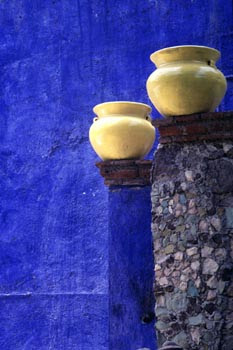 I love colors and Mexican Style. I find those colors soothing. Whether bright or more subtle, color is refreshing. That first photo, that bright blue, that's my color, girl! Mine is the aqua-green of the ocean. It has a physiological effect on me. Instantly I feel better. that blue is magnificent- I am told it deters flies! who knew insects responded to color therapy of sorts?! love the blog and the photos! It's like out of this world..., the North East "World" anyway. Such vibrant and deep colors. Beautiful, Linda! I love the color and the arches!! Ahhhhaaaahhh, Thanks for some color to brighten my day today! That is alot of FUN colour... LOVE it! BTW... let me know when you want to be my guest blogger... here are dates I have open... April 21, 22, 28, 29... I can't wait to see what you came up with! GORGEOUS!! I love Melba Levick! I have her book, "Mexicolor" and it's pure happiness on paper. Linda, it's always a mini-vacation for me when I come to your blog! 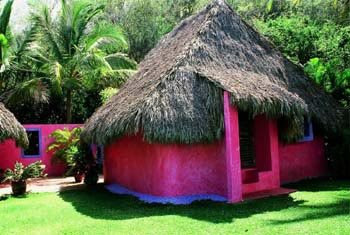 I think I could do with a hot pink thatched hut right about now--lovely post! love those colors and gaugin. He definitely got to enjoy vibrant colors in tahiti, my kind of guy. happy easter linda!